After Cerialis had run the course of his three years in office, a new and different style of governor took control. Julius Frontinus was a more forward thinking governor. He was not only a military man, but also wrote in matters both military and engineering. His actions were to build more forts in Exeter, Gloucester and Caerleon where the II Augusta were based. This was a very strategic fort, as it allowed access to the Bristol Channel, South Wales and the lower West country of England. The forums at Verulamium and Cirencester were probably attributable to him also. He followed a policy of Romanising Wales, and the Silures in particular, moving their centre from LLanmelin Wood to a new town built at Caerwent. He went on to complete the Romanisation process by forming the Silures into the republica civitates Silunum. Unlike Ostorius Scapula, he did not try to wipe out the Silures, but took on a policy of assimilation. Tacitus was the main historian of the time, but as he was married to the daughter of Julius Agricola, means that he could not have given an impartial view of events. Indeed we have more information on Agricola than any other consul, so many of his records are likely to have been written through his own personal bias. So whether Frontinus was in office until 77 or 78 AD. is not clear. Tacitus was too engrossed with writing about his father-in-law to tell us. Now it was the turn of Julius Agricola to take command as the new governor. Against strong advice, he marched into Ordovices territory and carried out a campaign of slaughter, to the point where they were almost completely wiped out. This may have been a vengeance attack as the Ordovices had destroyed a cavalry squadron some time before. The attack was a surprise as campaigns were started in the warmer months of the year. From there, he turned to Wales and carried on with the advance, crossing the water to take Angelsey. He was taking up the work of Paullinus and there was no stopping him. He did not stop at terror, he also forced exorbitant quotas on the British people. It was common for the Britons to have to buy back their grain they had already supplied as taxes. The buy back price was, of course, much higher than the price they had been given when it was handed over. They then had to deliver it to military posts at some distance, over inadequate roads. The following winter was taken up with the soundest projects. In order to encourage rough men who lived in scattered settlements to live a peaceful and inactive manner, Agricola urged them privately and helped them officially to build temples, public squares with buildings, and private houses. He praised those who responded quickly, and severely criticised the laggards. In this way, competition for public recognition took the place of compulsion. Moreover, he had the children of the Britons educated in the civilised arts, and openly placed the natural ability of the Britons above that of the Gauls, however well trained. The result was that those who had once shunned the Latin language, now sought fluency and eloquence in it. Roman dress too, became popular, and the togas were frequently seen. Little by little there was a slide towards the allurements of degeneracy. Assembly rooms, bathing establishments and smart dinner parties. In their naivety the Britons called it civilisation, when it was really part of their servitude. The following year, when the weather was warm and the campaign season had started, Agricola again made advances, spreading terror. This time he built forts in strategic places around the tribes he had defeated. He controlled the conquered areas by separating the tribes into small units, then placing them in areas where it was possible to watch over them. This ensured that they did not regroup and so enabled the chance of rebellion less likely. Many tribes surrendered because they knew of Agricola's policy of fear heaped on those who opposed him and advantages for those who cooperated. Agricola's strength lay in his ability to get the balance between persuasion and pressure just right. He supplied architects and engineers to provide the tribes people with assistance in building town systems in common with the layout favoured by the Romans. There still stands evidence of this, such as the tile works and Somerford Keynes near Cirencester. There they would have manufactured building materials for use in the surrounding areas. In the next season of campaigns. Archeological finds lead us to believe these were in two columns, one through Corbridge and the other as far north as Carlisle, where a new fortress was built. It turned south east to meet the first. Where they joined, the combined forces moved towards the Tay. By placing garrisons along the route, he could keep a watch over the inhabitants, while he pushed onwards. The emphasis of the next season was on the possibility of conquering Ireland. He may well have made a crossing from South West Scotland via the Solway Firth. He believed the whole of Ireland could be taken with just one legion and a few auxiliaries. In any case, he certainly did not proceed beyond this. This may have been because of a problem that occurred in the summer of 82 or 83 AD. when his attention was diverted in the Forth - Clyde region. To suppress this uprising, he launched an assault by land and sea. He divided his forces into three. This was a big mistake, as the Britons carried out a night assault on the Ninth legion,# that was so fierce that it almost succeeded. This defeat for the Romans was only avoided by the arrival of the remainder of Agricola's army. The following year he again took to the battle field to spread his occupation further up the north east of Scotland. Again, the troop laden boats made a shore landing and spread inland to instill fear into the natives. At Mons Graupins, they engaged the enemy, who this time, were going to fight it out. Agricola had 8,000 auxiliary infantry, 4,000 - 5,000 auxiliary cavalry. The size of his forces is uncertain, but from our knowledge it must have totaled between 17,000 - 30000. The standard battle tactics were employed with the auxiliaries at the front, with the legion held back in front of the camp. The Britons knew of the Roman tactics of taking the higher ground to come down on the enemy, so they positioned themselves above the Romans, this time placing their chariots in front of the main body of troops. Agricola dismounted from his horse and led the charge from the front. The Romans believed it was good to boost the morale of their troops by leading from the front. The first part of the battle consisted of the exchange of missiles, followed by hand to hand combat. At the same time, the cavalry appeared and went among the tribal forces scattering them as they went. 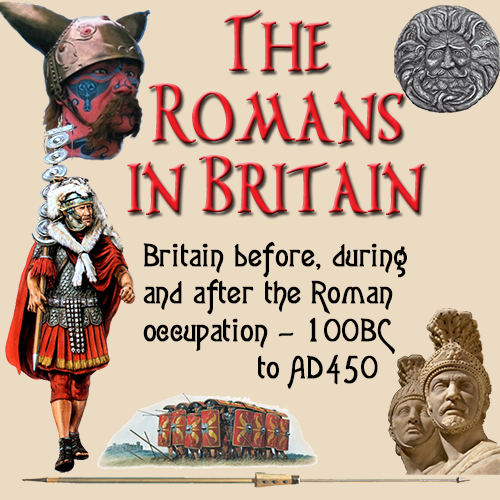 Unnoticed by the Romans, the British tribes moved down the slope and encircled the rear of the Roman force. At a signal, four squadrons of cavalry held back before, came forward and burst through the British line, circling round behind them. Tacitus says that some 10,000 Britons fell for the loss of 360 Romans. By night two thirds of the Britons had fled, back to the highlands from whence they had come. It was Roman policy to kill or capture all of the enemy so as to prevent any fighting another day. To have so many (20,000?) escape was considered a big mistake. Agricola set up forts and settlements at Inchtuthil on the Tay, and auxiliary forts at Cardean, Stracathro, Loch Lomond, Drumquhassle Ridge. Tacitus wrote that 'Predomita Britannia et statim missa'. Britain was completely conquered and immediately let go. Being the son-in-law of Agricola, he would give an impression that the Romans held the whole of Britain, even though they did not. He is also saying that the gains were 'let go', lost by Agricola's successor Emperor Domitian. What Tacitus also fails to mention, is that Agricola was recalled to Rome early. His account of the death of Agricola suggests poisoning arranged by the Emperor. There is now a gap in the records, between Agricola's death until the death of Domitian in 96 AD. Whoever succeeded Agricola. it looks as though he was going to carry out the invasion of Scotland to the bitter end.